RadTileList offers group titles (Figure 1) as of Q1 2016. To set the title of a group, use its Title property (Example 1). You can also set it on the client side via the set_groupTitle method (Example 2). 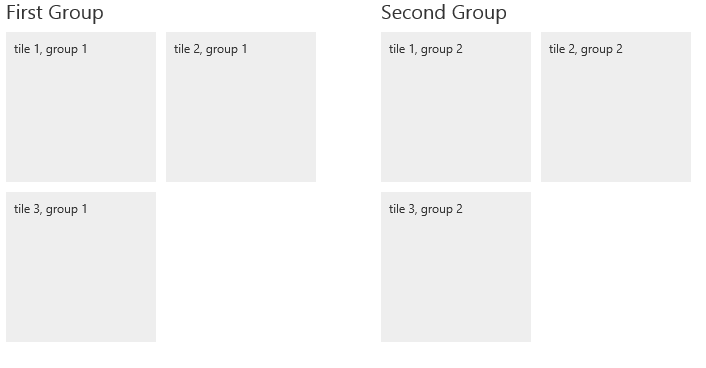 When data binding a TileList control, you can set the group titles declaratively when you define the groups structure. Alternatively, you can use the OnTileDataBound event to access the associated data item and set a group's title according to your business logic. You can see this in action in the Declarative DataSource Live Demo. Example 1: Set group title via server property. This code results in Figure 1. Example 2: Set group title on the client side. Example 3: Clearing group titles on the client.